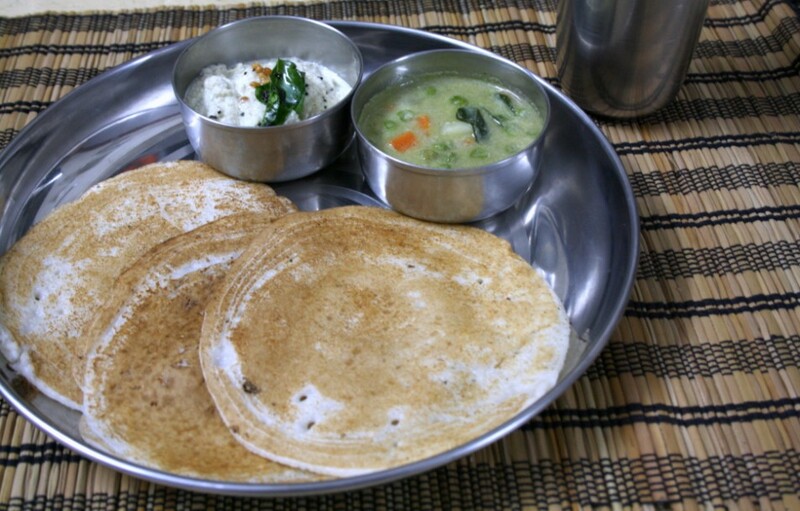 When I hosted Dosa Mela, one of the dosa variety that I was planning to make was this Set Dosa. I had read about this dosa in many magazines and blogs too. I had even written down many proportions that were supposed to be followed for this. Though all the recipes varied in their ingredient lists, one basic ingredient that was normally never added was the poha that was added. For the regular dosa batter, we don't add poha/ beaten rice. Though it otherwise might be your regular batter. So this time when I decided to do seven different dosas, I wanted to make sure I make this. Interestingly the side dishes made for the Set dosas were typically the Saagu and some chutney. The chutneys and the Saagu seem to be as versatile as the dosa batter itself. Each one had their own version of doing the saagu, some were spicy and some were so much like the kurma. I once remember eating Saagu in my hubby dear's native place. Anantapur, being closer to Bangalore has lot of influence on their cuisine. 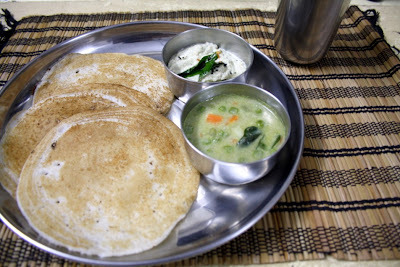 Many of the dishes prepared reflect Karnataka style. The Saagu that was served was not very spicy but surely had coconut in it and that thickness which showed fried gram being used. Anyway all this made me settle for a milder saagu. Coming to the name as such, Nams says Set Dosa was coined by the restaurateurs long ago to refer to the four small dosas that were served in in a plate. Later when they saw the customers asking for half a set, they changed it to 3 per plate. How very interesting. I was remembering this when I had ordered for Dosas at my boys school canteen. The other day when I had taken them for convocation, there wasn't enough time to feed them breakfast. I wrongly assumed that we will be back home early. When I realized that it might be delayed, I decided to feed them something in the canteen. They were hoping to get Maggi, luckily the counter was not opened. They had only Dosa and Pongal. I saw that the plate had 3 dosas and I was remembering this tidbit. I saw another teenage boy heartily eating away the plate of dosas and realized for youngsters 3 per plate would be just right if not sufficient! I made with Saagu from Nams space, I wasn't looking for a spicy curry as I made this for dinner. Soak rice along with fenugreek and urad dal together for 4-5 hours. Soak beaten rice in separate bowl with beaten yogurt for 2 hrs. Drain water from the poha and grind with very little water to a smooth paste, set aside . water during grinding. Once done, add salt and leave the batter for fermentation overnight or for 5 -6 hrs. Once the batter is fermented, refrigerate the batter, use only amount you require. Before making the dosas, add in the soda and beat well. Heat griddle or tawa in medium heat. Pour a ladleful of batter. Do not spread it but rather make sure the batter is little thin so that it spreads on it's own. Cook on medium heat and flip it to the other side and cook for couple of minutes. It should not brown. Serve hot with coconut chutney and saagu. Make sure you are not adding lot of water during grinding, and the batter is not too thin. You can always dilute it while making the dosas while adding soda. Refrigerate the batter that you are not using.